You wanted breakfast cereal, we bring you breakfast cereal! And what better cereals to start off with this Halloween season than none other than General Mills’ Monster Cereals? In 1971, General Mills decided to create new cereals centered on mascots inspired by the classic Universal Monsters. That March they debuted Count Chocula (Larry Kenney, impersonating Bela Lugosi who was best known for his roles as Dracula). Created by copywriter Laura Levine and first drawn by George Karn, he was a brown, single-fanged vampire who preferred the taste of chocolate to blood. It was touted as the first chocolate cereal to have chocolate-flavored marshmallows. The ads were produced by Dancer, Fitzgerald and Sample ad agency. 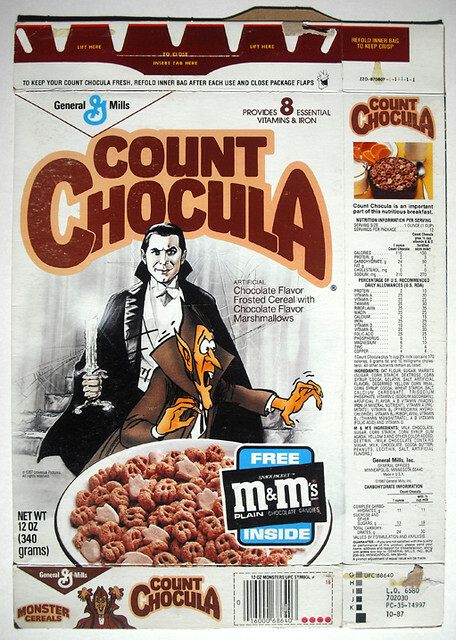 In 1987, a bit of controversy arose when Chocula’s box featured an image of Lugosi as Dracula sporting his customary medallion. Jewish groups believed it was the Star of David and an insult to their faith, resulting in the medallion being edited off of the boxes. In 1973, the next addition to the monster family came in the form of Boo Berry (Paul Frees, impersonating Peter Lorre). Boo Berry’s cereal was blueberry flavored with blueberry-flavored marshmallows. He wore a straw hat with a bowtie, and could often be found scaring the Count and Franken-Berry. The following year, the final monster in the official monster family was introduced with Fruit Brute; a werewolf who adorned a fruity cereal with lime-flavored marshmallows. Fruit Brute would become the first casualty of the monstrous quartet as his cereal underperformed in comparison to the others. The cereal was discontinued in 1982, although it did attain a cult status and fans often clamored for it to return. Fruit Brute cereal would go on to make an appearance in the movies Reservoir Dogs and Pulp Fiction. In 1987, General Mills attempted to give the cereal new life with a new mascot and name: Yummy Mummy, who blended Jamaican music with a traditional Egyptian sound in his commercials. 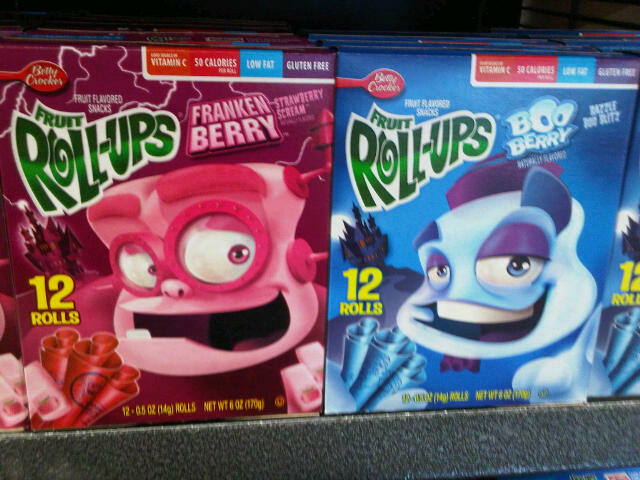 While the fruity pieces were retained, the marshmallows were changed to vanilla-flavored. Unfortunately, it seemed like the public was against the fruity cereal and it was discontinued once again in 1992. Over the years, the remaining monsters had their designs updated to coincide with the animation style of the times. However, sales for the cereals began to steadily decline, gaining a massive spike only in the fall season; particularly in October. 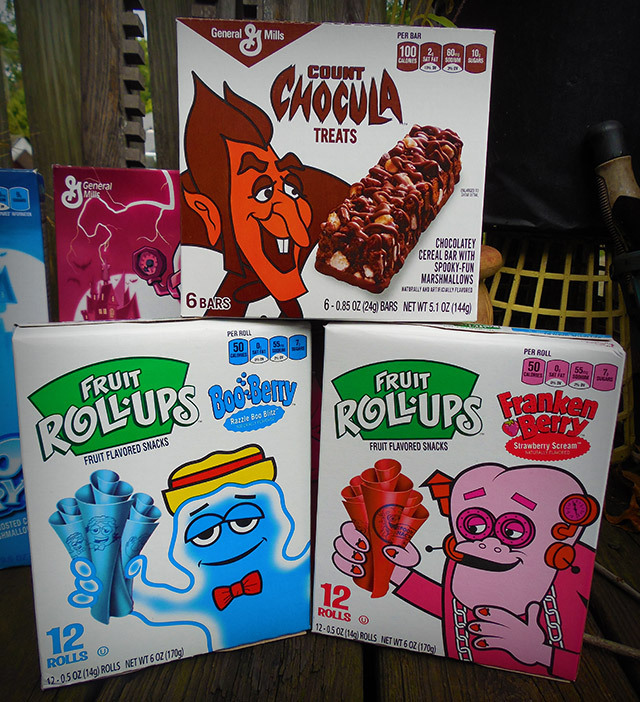 As a result, the cereals began to only be featured in select markets rather than being widely distributed, particularly the less-popular Franken-Berry and Boo Berry. 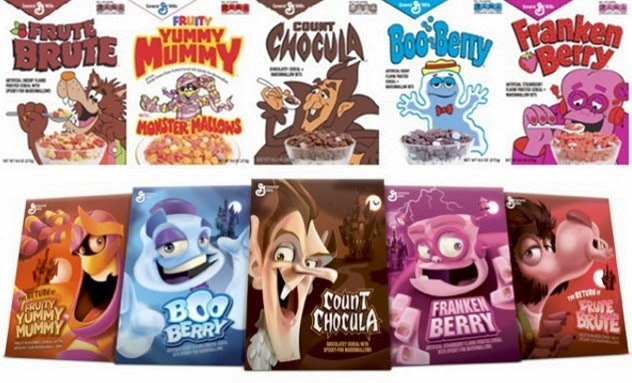 In 2010, the same year Betty Crocker released Franken-Berry and Boo Berry Fruit Roll-Ups and General Mills released Count Chocula cereal bars, General Mills began producing the monster cereals on a seasonal basis in the fall months. 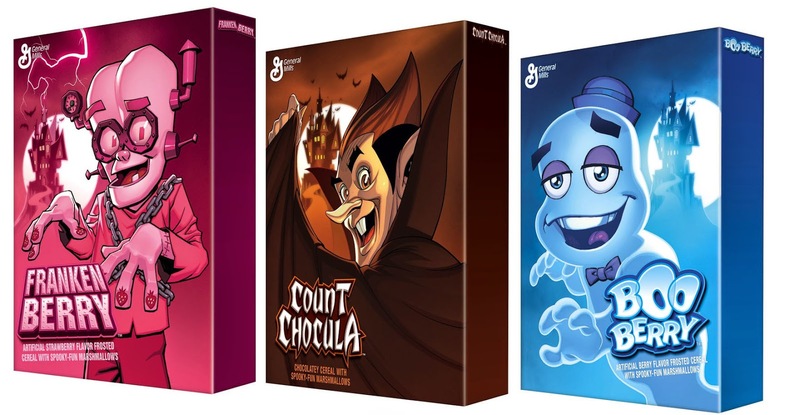 The five monster cereals, together again for the first time. Retro (above) and modern versions. In 2013, for the first time since their ending, Fruit Brute and Yummy Mummy were bought back with the other cereals, making it also the first time all five cereals were available at the same time. Target also exclusively carried the cereals with retro packaging, reminiscent of the cereals’ debut. Even the aforementioned Fruit Roll-Ups and cereal bars received the retro touch despite not existing when the cereals began. The 2014 DC Comics editions of the boxes. In 2014, General Mills partnered with DC Comics to feature a re-imagining of their boxes using DC artists. Terry and Rachel Dodson rendered Count Chocula, Dave Johnson did Franken-Berry, and Jim Lee tackled Boo Berry. The boxes also featured a comic strip by Brent Schoonover. Target once again carried the retro versions of the box, each with a cut-out mask of the mascots. 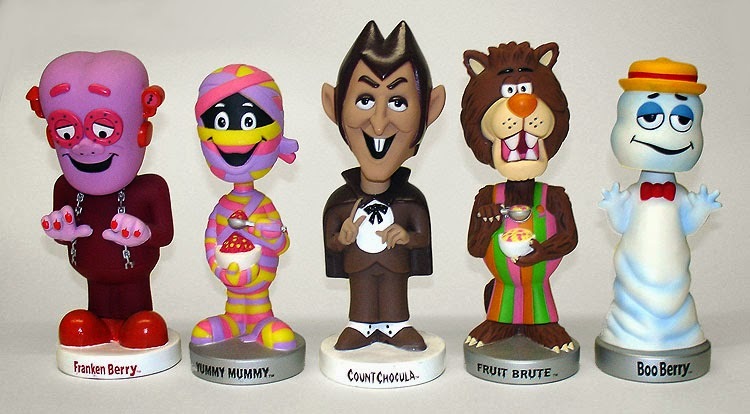 Monster Cereal bobble head statues. The cereals remain popular, with countless fan websites dedicated to them. Not popular enough for year-round production for General Mills, but enough to keep them coming back every year. Many of the boxes have become sought-after collector's items, on top of the merchandise featuring their respective characters. New merchandise continues to be made with them, including bobble-head statues and vinyl figures. I know NOW that the cereal was probably not good for us, (too much sugar). 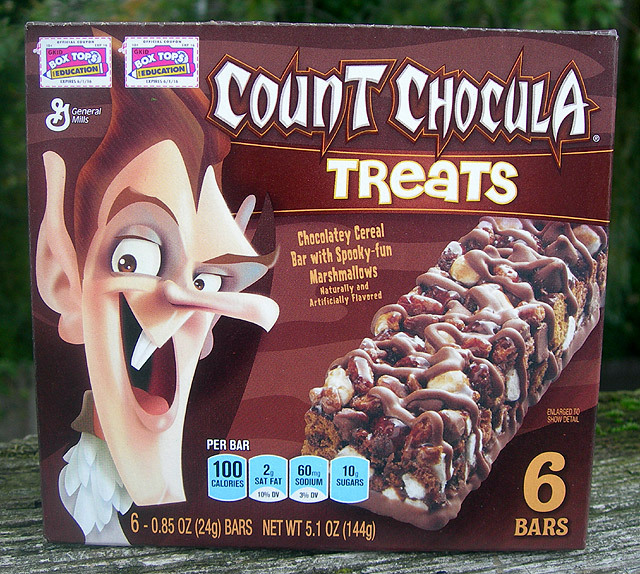 But DAMN, I LOVED Count Chocula!!!!! LOL!! !